THIS story happened to an R.F.C. pilot, Lt. J.R. Gilbert. He was flying alone and was a considerable distance in enemy territory, when he sighted a speck ahead to the right. On investigation it proved to be a Gotha, alone and unescorted, with a load of bombs and headed toward France. Although Gilbert was alone he went to the attack, not knowing that he had been observed by the crew of the bomber. In the fight that followed the Englishman sustained a damaging fire and used up his ammunition. Withdrawing, he flew at top speed to his drome. Here he landed, changed ships and returned. He sighted the bomber, just over the lines, but this time planned a surprise attack. He scudded under a layer of clouds and in so doing did not see that the Gotha had been joined by a Fokker. He took the bomber completely unaware, coming up under its bow. His guns ripped the Gotha’s nose to ribbons, killing the gunner and wounding the pilot. Gilbert then dove away to escape the falling plane but was surprised to see tracers flash by his head, shattering his instrument board. Turning, he saw the Fokker on his tail. 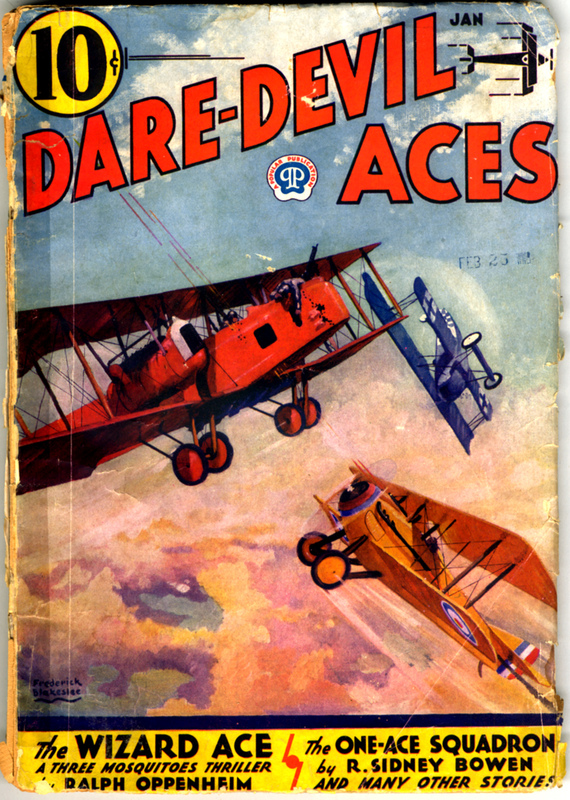 Then began a tremendous power dive—his only means of escape for he knew that in combat the Fokker could have flown circles around his Spad. 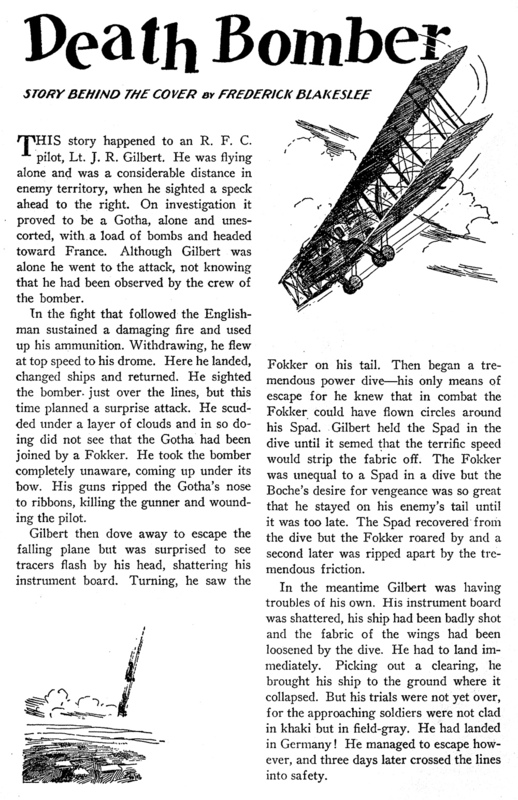 Gilbert held the Spad in the dive until it semed that the terrific speed would strip the fabric off. The Fokker was unequal to a Spad in a dive but the Boche’s desire for vengeance was so great that he stayed on his enemy’s tail until it was too late. The Spad recovered from the dive but the Fokker roared by and a second later was ripped apart by the tremendous friction. In the meantime Gilbert was having troubles of his own. His instrument board was shattered, his ship had been badly shot and the fabric of the wings had been loosened by the dive. He had to land immediately. Picking out a clearing, he brought his ship to the ground where it collapsed. But his trials were not yet over, for the approaching soldiers were not clad in khaki but in field-gray. He had landed in Germany! He managed to escape however, and three days later crossed the lines into safety.